Established in 1950, Parr Insurance Agency, Inc. is a full-service independent insurance agency servicing Crestline, Ohio. Original 2 Pocket Presentation Folder printed with four-color process on 14pt C1S White Semi-Gloss stock, coated with Aqueous Satin. H1 business card slits on right pocket. Kimberly Sterry of Parr Insurance Agency, Inc. needed folders to hold promotional material for presentations and meetings with potential customers. 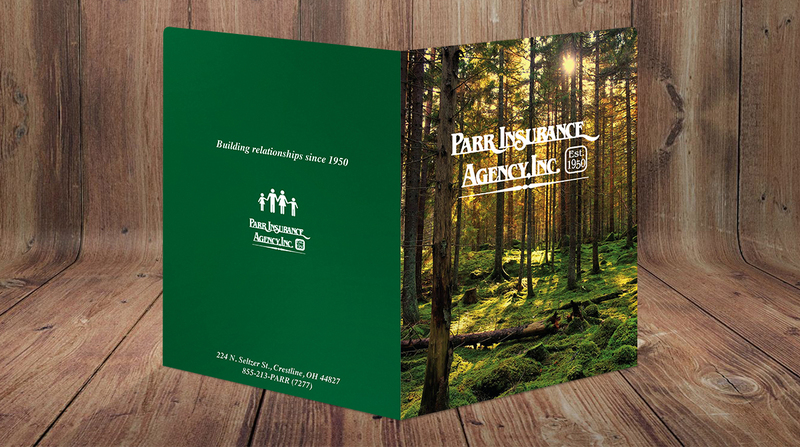 Parr Insurance Agency’s folders are a critical part of their marketing collateral; insurance agents give them to customers for meetings, presentations and referrals. In many cases, they are the first impression of the company’s marketing material. Because first impressions matter, Sterry knew how important it was to get the design right. With so many options available, it was hard for Sterry to choose what to select for her presentation folder, but Company Folders staff was on hand to walk her through the process. — Kimberly Sterry, Receptionist at Parr Insurance Agency, Inc.
“The variety of folders, textures and designs to choose from are endless!” she said. First, Sterry requested a sample of the Original 2 Pocket Presentation Folder in a 100lb Smooth White stock and 12pt C1S White Semi-Gloss stock. She said receiving the samples helped her narrow down her choice. Then, it was time to get designing. With little to no knowledge of the design and print process, Sterry said Print Project Director Jennifer Grubb helped her figure out the different stocks and imprints. Sterry received five quotes outlining a wide range of options. Grubb guided her through different stocks, coatings, and imprint methods to help her find the best solution within her budget. After checking out the company’s website, Grubb suggested the design mimic the forest image on the homepage to create consistent branding. Sterry ultimately went with the Original 2 Pocket Presentation Folder printed with four-color process on 14pt C1S White Semi-Gloss stock, coated with Aqueous Satin. Not only was Sterry happy with the final product, but so were her co-workers and potential customers. With this process under her belt, Sterry said she’s better prepared for her next order. 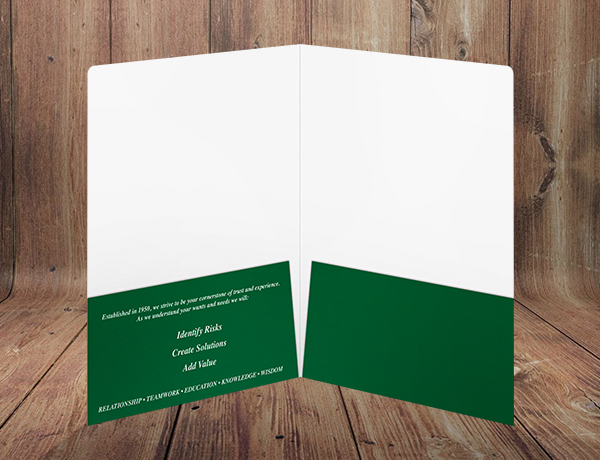 Want to design custom folders of your own? Learn how to create a custom folder online.